You follow me? Lettuce. It’s not so much an ingredient as an ultimatum: Eat it or be left to feel guilty about it instead. While doing a pop-up cooking event one summer where I wanted to make lettuce wraps, I decided not to buy any lettuce, but instead collect as many heads as I could from friends and friendly farmers who had one too many. I quickly gathered more than a dozen in a couple days. But due to some strange drought in my fridge recently, I went out and purchased a head of red Romaine lettuce at the farmers market. I had never seen this exact variety before, so I was smitten. 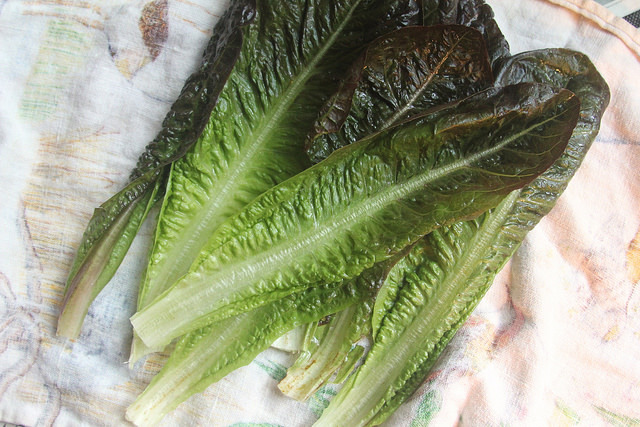 Like a purple carrot or purple cauliflower, it tastes and acts just like a head of Romaine. And with that reminder, I was sold on doing Caesar salad. There is nothing wrong with a vegetarian take on Caesar salad dressing, but the true classic involves anchovies. Garlic, anchovies, lemon and egg are whisked with olive oil until it’s a fishy aioli, and you can thin this out with more fresh lemon juice. This challenge is just what you need when it’s too hot to cook, as it’s all mincing and whisking, with inviting fragrance everywhere. 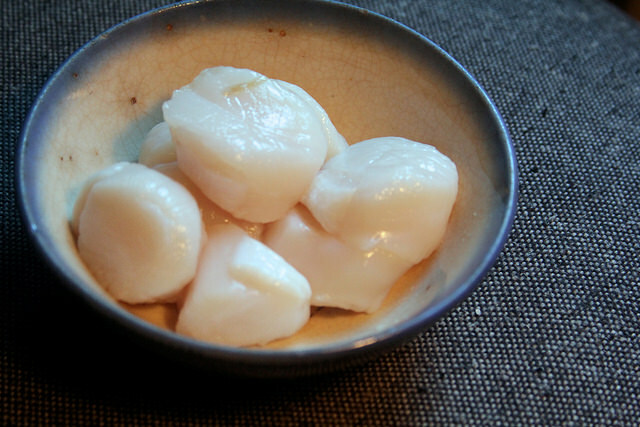 And if you must cook, make it a fresh lump of something that needs little time on the stove, like a seared scallop. Although these are rare and expensive to come by, I can’t think of anything quicker and more rewarding to brown in some butter. Big, juicy diver scallops are optimal when pinkish-raw on the inside, and just cooked on the outside. And they’re just the treat that can turn a familiar dish like Caesar salad into something special. You can easily fill it out as a complete meal with some toasted bread to accompany it. Whereas some soft-boiled egg halves could work humbler wonders for some good lettuce and your own homemade Caesar dressing, seared scallops (fresh from my local Blue Moon Fish) can do even more. It’s weird, though, because after crowding my plate with so many lovely toasts and scallops, I was craving even more of the recipe-incentive lettuce. To make the dressing, combine the egg yolk, minced garlic, mustard, anchovies and 1 tablespoon of juice from the lemon in a small bowl. Whisk to combine thoroughly. While whisking rapidly, pour in a few drops of the olive oil. Continue whisking, and slowly drizzle in more of the olive oil. The mixture will emulsify and appear thicker as you continue incorporating more of the olive oil. Continue whisking in the rest of the olive oil until all is incorporated. Taste for seasoning, adding salt and pepper as desired. 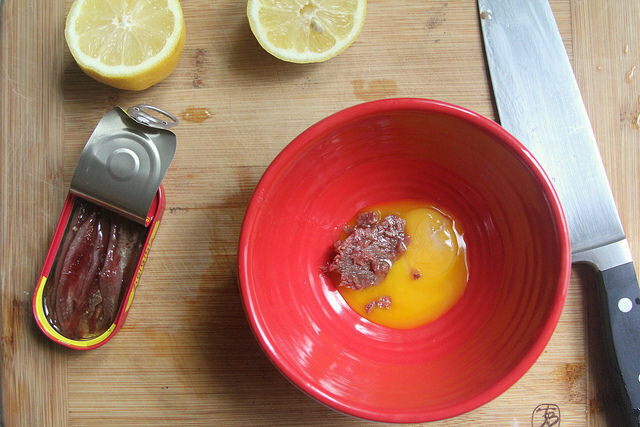 Add another small squeeze of lemon juice at a time to taste, if desired. Use immediately or store covered and chilled for up to a day. Heat the oven to 400 degrees. Arrange the baguette slices on a roasting pan. Drizzle with olive oil and season with salt and pepper. Toast them for about 5 minutes, or until just slightly crisp. Remove from heat and let cool. Rinse and pat the scallops dry with paper towels. Season with a sprinkle of salt and pepper around all sides. Heat a heavy-bottomed pan, such as cast iron, on high heat. Once it’s very hot, add half the butter, and as soon as it melts, place 6 of the scallops on the pan with at least half an inch in between one another and don’t move them. After about 1 minute, peek underneath, and if the bottom is golden-brown, flip. Let the opposite sides lightly brown for another 30 seconds, and transfer from heat immediately. Repeat with the remaining butter and scallops. 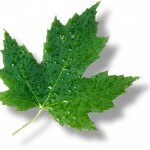 Break the lettuce leaves from the head, keeping smaller leaves intact and cutting large ones to evenly-sized pieces. Toss with the dressing. 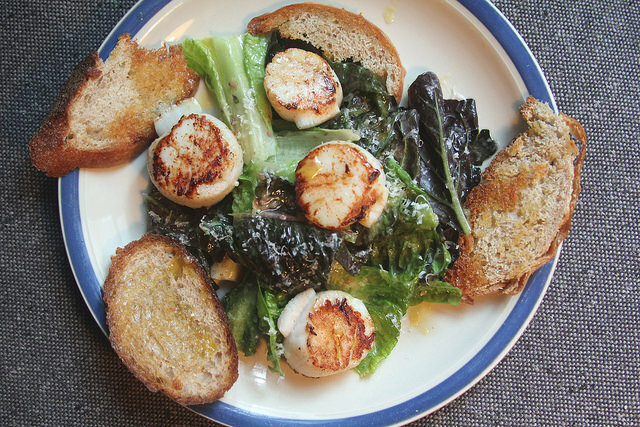 Arrange on plates, and top each with 3 of the scallops and 2-3 slices of baguette. Sprinkle with grated optional cheese. Serve immediately. Four brownie points: While not a superfood, Romaine lettuce has a lot of leafy-green nutrition like Vitamin K, Vitamin C as well as fiber. Pile a lot of it onto your plate. This dressing also contains valuable omega-3 vitamins from those little anchovies, a great way to sneak this beneficial fatty acid into your diet. You’ll get even more of that from the scallops, a shellfish that are more than 80% protein. Six maple leaves: Wild sea scallops are considered a “best choice” seafood by the Seafood Watch program at Monterey Bay Aquarium. So they’re a splurge you can feel good about. On the other hand, little fish like anchovies are incredibly cheap as well as sustainable choices—one of the most abundant fish in the ocean, they’re what many bigger fish eat, but delicious and nutritious for us, too. As for the rest of the ingredients in this salad, this recipe is a good way to use up extra lettuce you’ve got, rather than letting it go to waste (and hey, other veggies are fine to toss in as well). And it’s a great use for stale bread, too. Wow! Caesar salad with seared scallops!!! I tried this recipe several times before but couldn’t do the best. Your post seems perfect for this recipe. Gonna try once more. Thanks for awesome sharing! Can’t wait to try this recipe! I will definitely buy some sea scallops in the market this afternoon. The recipe looks pretty good, that’s a nice twist to a classic salad. Curious to taste it! 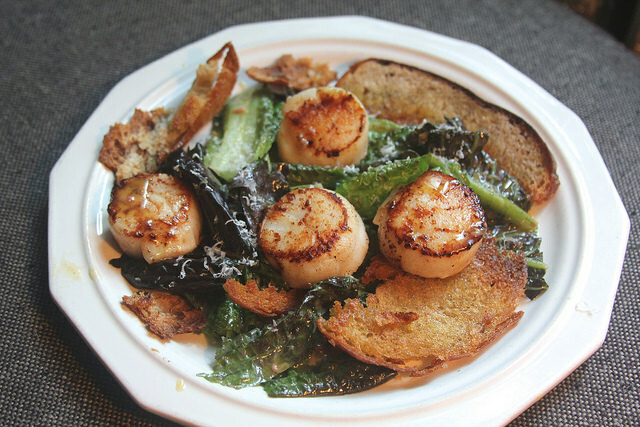 Caesar salad with seared scallops is the thing I never tried before. But this recipe looks delicious. Hopefully I’ll try it. Thanks for sharing. If you ever suspect your partner might be cheating on you, get to catch and find out about his or her cheating cases with evidence to prove it, spy into partner mobile and gain access to all call logs, texts including deleted messages, social media activities such as whatsapp chats and chat history, facebook messages and pictures, gain access to see all multimedia content and gallery folders, recover passwords, phone and web monitoring including audio and video surveillance, and lots more can be done for you. Find (h a c k e r l o u n g e . n e t) on the internet via your PC for help. They provide solution to all spy needs; they are really the best. apparently your recipe is looking great, this is something new that i never tried so definitely i am gonna try this recipe. thanks for your motivation. 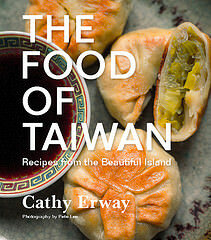 i really cant wait to make this recipe at home. presentation is so yummy that it really brings water in my mouth.